Their legal skills have helped hundreds of injured victims gain generous and fair compensatory awards. Personal injury settlements, jury verdicts and arbitration awards in the millions of dollars have been achieved by the firm. Norman L. Kline, Esq will represent your personal injury legal matters. George Washington University Class of 1968 J.D. Rutgers University Class of 1965 A.B. Norman L. Kline is a trial attorney with over 30 years experience in civil and criminal law. 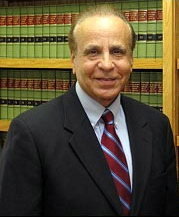 A graduate of Rutgers University and the George Washington School of Law, he is a former Assistant Hudson County Prosecutor and Deputy Public Defender. Norman now concentrates his practice in civil litigation, with a focus upon personal injury, medical malpractice, sexual harassment in the workplace, employment discrimination, commercial litigation, as well as complex and white-collar criminal matters. Norman also has extensive experience in all types of Municipal Court matters, including all criminal allegations, drug-related offenses, driving while under influence of alcohol/drugs, driving without insurance or while on revoked list, as well as routine motor vehicle charges.